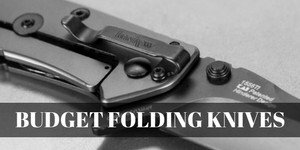 Whether you're a hunter, outdoors man, or simply like the convenience of carrying a knife, picking out the best pocket knife sharpeners can quickly become overwhelming (believe me, there are HUNDREDS to search through). Instead, to save you the trouble, we've put together a quick guide to the 10 best pocket knife sharpeners currently on the market to help you quickly narrow down your search, and get your knife sharp and back in action. As wise grandparents like to say, a dull knife is a dangerous knife. And as any experienced knife user knows well, a sharp knife allows more accurate, higher quality cuts. ​Straightening out the dings, knicks, and imperfections on the edge of the knife. This is called "steeling," and it's a great practice to get into to maintain the edge on your knife on a day-to-day basis. But we won't be digging into that here. Actually removing material from the edge of the knife, creating a new edge in it's place. This is what we mean when we say "sharpening" and it's necessary when your edge has gotten significantly worn down to the point where you need to remove, rather than fix, those imperfections. But keeping your knife sharp isn't always top of mind, especially when your sharpening options are inconvenient. ​Designed to be super light and compact, these sharpeners are typically 2-3 inches in length and can easily clip onto your bag or fit in your pocket. With a two-stage angled sharpening stone system, combined with a fold out sharpening rod, you can take your knife from dull to sharp in a few strokes through each, and even maintain serrated or hooked knife edges. ​While you'd typically associate them with kitchen knives, table-top sharpeners can also be used for pocket knives. Larger, heavier, and easier to handle than smaller sharpeners, these typically have grippy material on the bottom surface and a hand hold away from the sharpening point, which creates a safer and generally more consistent sharpening experience. ​The smallest of the set-angle sharpener options, compact centerline sharpeners have opposing sharpening channels on the top and bottom with small hand grips to either side. Creative in design, these allow a steadier table-top hold. At the same time, they're also light and small enough to clip to the outside of your bag for convenient carrying. ​This one falls outside of the fixed-angle category. Designed to be quick and simple, stand-alone sharpening rods are best used for doing a rough sharpen on serrated pocket knives or other utility tools. Here you'll gain speed and versatility, but lose the consistency and fine edge, having to set the edge angle yourself. ​Okay, now that you've got the lay of the land, here's our list, ranked based on user reviews and popularity on Amazon. Coming in at the top of the list, the Smith's PP1 is the lightest, and most cost-effective of the fold-out sharpeners on our list. Clocking in at just 1 oz in weight and 3.5 inches in length (about the same size as most pocket knives themselves), this sharpener can easily slip into your pocket without you even noticing it's there. ​It's designed with two sharpening slots with standard pre-set angles. The first holds two coarse carbide blades to set the edge, where a few strokes will quickly remove the rough areas on your knife blade. The second slot holds two fine ceramic blades to hone the edge to a sharp finish. ​Additionally, the PP1 has a fold-out tapered diamond rod for uneven blade surfaces. This extends the versatility of the sharpener to include serrations and gut hooks, which do require some manual edge angle setting but are able to sharpen in and around those non-uniformities. ​Because the body of the sharpener is made with plastic (which is what makes it so light), it has been reported to be less durable that other heavier alternatives. Also, because the fold-out sharpener design is so small, it can be tough to maintain a consistent and safe grip while sharpening. But otherwise, you won't find a more economical sharpener for your dollar. The Lansky Blade Medic is the slightly more expensive counterpoint to the Smith's PP1 within the same category. Similar in size, with the same tungsten carbide, ceramic, and tapered diamond sharpening surface setup, the Lanksy has a metal (rather than plastic) body, which increases it's weight significantly (around 4 times heavier than the PP1). ​For some, they find the added weight a benefit, making it more robust with an enhanced grip for sharpening. For others, the added weight is an unnecessary downside compared to lighter alternatives. ​It mostly comes down to preference, but if you're looking for a sturdier sharpener, the Lansky is a great option. Next up is the first of the table-top sharpeners - the Besiva 3-stage sharpener. Again, the advantage of the table-top sharpeners is improved stability, safety and consistency during sharpening because of their larger size (this one is 11.4 ounces vs. the 1-4 ounces of the fold-out sharpeners), hand grip off to the side, and ability to place firmly down on the table during sharpening. This specific model also has 3 separate sharpening stages, for an even more consistent sharpening process. The first slot, called the “prep slot” is designed to realign the large imperfections in the knife edge and get it ready for the second “sharpen slot” which then performs a coarse sharpen to create a new knife edge. Finally, the third “finish slot” does a fine polish on the edge to create the sharpness you’re looking for. Downside? As with all 4 of the table-top sharpeners that make this list, they’re just not as portable. You’re going to have to get your sharpening done back at home in-between outings, so if having the ability to sharpen out in the field is a priority, these probably aren’t for you. This model (along with the other 3 on this list) also doesn’t have any options for serrations and hooks, which decreases its versatility. The price is also higher than the fold-outs as well. ​Coming in a number 4 is the first of the compact centerline sharpeners on our list, the Alpha Tek Pocket Hunting Knife Sharpener. ​This little guy combines the table-top stability of the Besiva (it has a flat grip surface on the top and bottom so you can set it down on a stable surface while sharpening), with the compact size and weight of the Smith's PP1 (approximately 3” x 2” and 1 oz. respectively). ​It also has a coarse sharpening carbide and fine sharpening ceramic setup similar to the Smith's and Lansky, but lacks the fold-out tapered rod, it’s main downside. ​Some users also report that the side grips make it a bit difficult to hold, and place your fingers pretty close to the knife blade during sharpening, so you’ll need to exercise caution during use if you go with any of the compact centerline designs. ​The price is also on the high side among the portable lightweight sharpening options. Number 5 is a Besiva table-top again, this time one that replaces the “prep slot” with a “ceramic” slot designed to sharpen ceramic knives. Very similar in design to the 3-stage Besiva, you’re essentially getting the same sharpener in design and weight, with a slightly different sharpening setup. ​If you’re a ceramic knife user, this may be the sharpener you want to go with, but otherwise the price and added prep slot makes the Besiva 3-stage a more attractive option for most pocket knife users. ​Next on the list is Smith’s compact centerline offering. ​Almost identical in design and construction to the Alpha Tek, it does have a significantly lower price point (as of this writing it’s the cheapest sharpening option on our list). ​So if you're looking for a cheap, no frills option that will get the job done, this might be your sharpener of choice. However, some reviewers do report that the fine sharpening slot is not as effective as other similar models. ​Number 7 on the list is the equivalent 3-stage table-top sharpener to the Besiva from Koolife. Looking at these two knife sharpeners there isn't much difference other than the brand names. With the same prep, sharpen and finish slot ​setup, the only real choice it would seem is which brand you feel more comfortable with. Both knife sharpeners are priced identically and both have fantastic reviews from happy customers. Our eighth option is the 3rd and final compact centerline sharpener on this list from Hoffman Richter. ​Very similar in attributes to the Alpha Tek and Smith’s options, the main difference here is that Hoffman Richter comes with a brand reputation for creating really solid knives. ​It’s also comparable in price to the Alpha Tek, but comes in black rather than green or orange (if color is important to you). At spot #9 we see Koolife again with their other table-top offering, a 4-in-1 knife sharpener that includes a scissors sharpening slot. If you’re looking for a little more versatility, the extra scissors option could justify spending a little more; however, it still lacks the ability to tackle serrated or gut hook knives like the other table-top sharpeners. It’s also slightly heavier, with a blocky look and metallic finish if that’s something you’re interested in. Finally, to round out our top 10 list, we have our first and only stand-alone sharpening rod option. The GVDV Tactical Pocket Size Pen Sharpening Kit includes a small pen-sized sharpening rod designed for delivering a quick, coarse, sharpen to your pocket knife. Personally for a quick sharpener for my pocket knives, I have both the Smith's Pocket Pal and the Lansky Blade Medic. I use them often and would recommend them both to anybody who asks. Ultimately, the decision of which pocket knife sharpener to choose comes down to your preferences, because each of the options here have tradeoffs: safety vs. size and convenience, speed vs. precision, price vs. quality of construction. Regardless what you choose, keeping a sharp knife is an essential tool of the trade when it comes to pocket knives. Keep in mind that no matter which you choose, exercise caution and be safe. A sharp knife is a safe knife, but only when you use it properly.